Lookers Jaguar Land Rover West London celebrated the launch of its £12m luxurious new showroom. Loyal customers and Jaguar Land Rover VIP’s were joined by special guests; explorer Sir Ranulph Fiennes and Monty Halls. 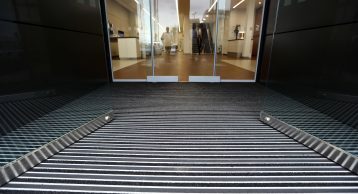 INTRAsystems could not be prouder to collaborate with Jaguar Land Rover in installing INTRAform Aluminium Entrance Matting and welcoming such prolific guests with our Entrance Matting. INTRAsystems has gained considerable experience operating in a number of industries and adding tremendous value proposition through installations and specifications of its innovative products range. Now we can add Jaguar Land Rover to that impressive portfolio. They relied on our market knowledge and attention to detail to make a grand entrance. For any high-end automobile showroom a clean and aesthetically appealing visual is much valued. This was a crucial element for JLR. 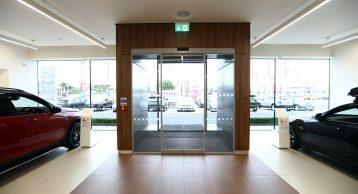 INTRAsystems worked hand in hand with the designers to implement the most aesthetically pleasing appearance in the showroom. 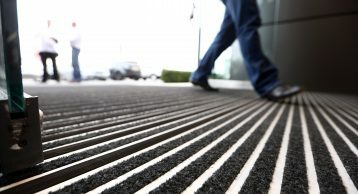 For any Entrance Mat, safety is of prime importance. 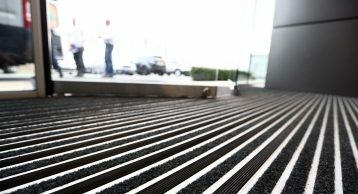 INTRAform Heavy Duty Entrance Matting is exceptionally hard wearing and durable with interlocking sections making it easy to install. There are a wide range of inserts ranging from fibre, rubber, and brush. 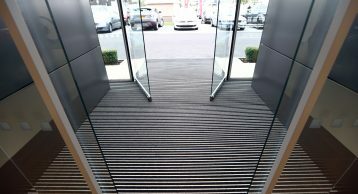 Its closed construction makes this product easy to clean and maintain, this grabbed the attention of JLR. 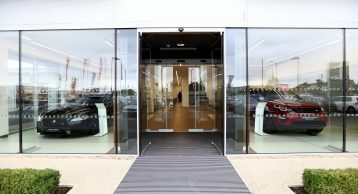 Lookers West London has also included two new handover studios, where customers can see their dream car unveiled before driving straight out of the showroom. More than 1,800 Jaguar Land Rover sites globally will be updated with the new design, which brings Jaguar and Land Rover brands under one roof.